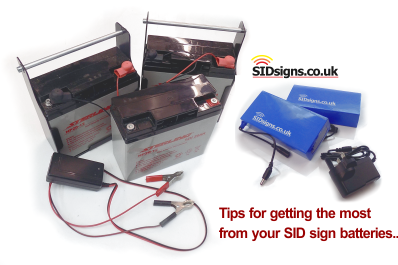 Tips for extending sid sign battery life. Tips for extending battery life. Getting the most from your speed sign batteries. There are some practical ways you can help to extend the life of your speed sign batteries; simple tricks which eliminate power wastage. The battery inside your speed sign stores a finite amount of electrical power; as the old saying goes; "once it's gone it's gone". Before we reach for fresh batteries or look for the charger let's think about how we minimise how much power we use. Made possible by the new software control system there are now a number of very easy things we can instruct your sign to do in order to save as much battery life as possible. None of this was possible previously but with the latest generation of speed signs it's easy. Every speed sign can be told when to start responding to traffic; a what speed they start doing something. If you don't need to know about traffic travelling very slowly then set your starting speed a bit higher. For example, on a 30mph roadway you could afford to ignore anything travelling slower than say 20mph. Changing this setting save power by not responding to irrelevant low speed detections. It's tempting to want to see the speed of every approaching vehicle displayed on your speed sign but this puts more demand on your batteries. Every time an led on your sid display lights up a small amount of power is used. For fixed speed designs setting the turn ON speed to a value 10% greater than your speed limit is a good idea. Making the led's flash uses half as much power, turning the sign OFF at a speed of say twice the posted limit can also help save power. If you are using a battery powered speed sign which has a dynamic speed display you can set this to turn on at a specific speed. Let's say your sid display in on a 30mph road; you could use the sign to show every vehicle what speed they are doing no matter how slow. If you change this to just displaying vehicles which are close to or at the posted limit it's a simple way to extend battery life. If you don't need to light the sign you'll save power. The same principle can be applied to smiley faced & thumbs up/ down sid displays. Limit the band of speed within which a Green face will appear and you can extend battery life. Set graphics to flash on and off and save power this way. The easiest ways to extend speed sign battery life are trimming the software settings so the device only illuminates when strictly needed. All batteries have a life cycle, a maximum number of times they can be charged and recharged before they need to be replaced. As a general rule healthy batteries are happy batteries, ones which are looked after and treated to regular recharging. Most batteries don't like to be run completely flat, doing this can damage the internal structure of the battery meaning that next time it's put on charge it won't allow as much electricity to be stored. Looking after your batteries can be the easiest way to not only extend the overall life of the battery but help to preserve the maximum storage capacity. The best option is to have some kind of regular battery regime in place. It's good practice to rotate batteries so they are regularly charged from the mains. If you have solar panels why not change the batteries before they run out of charge? Leaving batteries to run and run until they stop completely is never a good idea. A simple battery maintenance routine is one of the best ways to ensure you are getting the most from your battery sid display.